The BSA Fashion Show began at Loyola in 1998 as a campus-wide event to showcase black talent and culture. More than two decades later, the highly-anticipated event organized by the Black Student Association (BSA) and sponsored by Loyola’s offices of student life, student activities, student engagement, and Messina, brings hundreds of students, families, faculty, administrators, and friends to campus every spring for a night of music, fashion, culture, and community. The audience is treated to fashion and music, of course. But they also enjoy performances by members of the Loyola and Baltimore communities who sing, perform, dance during intermission. Traditionally, intermission is also the time when the Student Government Association announces the headliner for Loyolapalooza, the spring festival that takes place a month later on Loyola’s campus. Planning for the event, which is held in late March each year, begins in the fall semester. Calls for the Black Student Association’s 80 or so members form working groups and a board. Members assume roles to lead and organize every piece of the planning—from directing to public relations and promotion; from leading scenes to recruiting and coaching models. A public relations coordinator is responsible for creating a marketing and promotion plan, managing social media, recruiting volunteers to post flyers/posters for the show, and managing promotion. The directors concept and create a theme for each year’s show and then build the show around it. The event, which aims to promote and celebrate diversity, will feature a theme with a focus on people of color. In the past, themes for the BSA Fashion Show have included #ForTheCulture, Black Allure, and Mystique. The directors of the BSA Fashion Show scout MCs in the early stages of the planning process. The candidates bring personality, charisma, and charm to the stage. The MC(s) change each year. 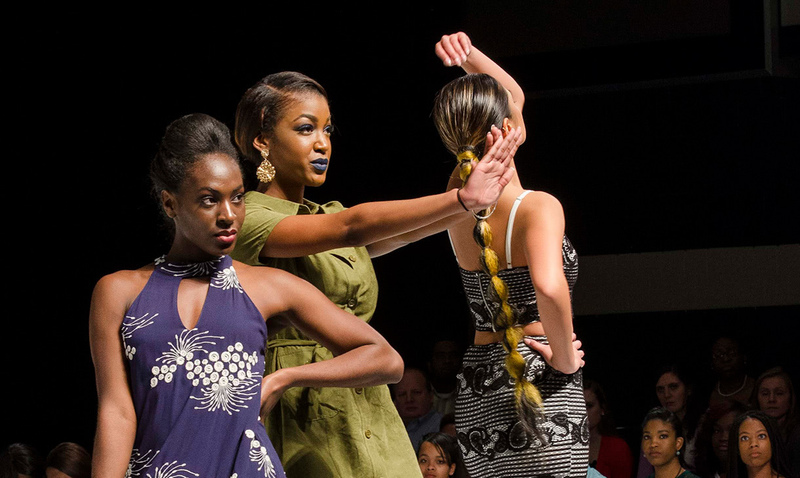 Local shops and Baltimore boutiques are scouted months before the show and are asked to participate by providing a certain amount of outfits for specific scenes. For me, the BSA Fashion Show is so special because it is entirely student run, and therefore relatable for students. The clothes support local boutiques and clothing retailers. Whether the store is downtown, in the Towson Town Center, or a traveling clothing truck boutique, the clothes are all things that we would want to wear as Loyola students, and moreover, things we can afford. Models for the event are Loyola students—which means experience isn’t necessary. The BSA calls for models and holds an audition phase during the fall semester. Models meet once a week with their assigned scene leaders, who help perfect their walk and prepare them for the show. Many students who participate as models one year return for another year’s show. My experience as a model was beyond what I thought my comfort zone was. Doing the fashion show pushed me to meet new people—and a new part of my personality. Directors and scene leaders cut and mix their own music and envision their own lighting. Musical/video content and lighting requests are provided to Loyola’s Event Services, who test certain cues and transitions during dress rehearsal and final rehearsal and bring the vision to life for the main event. The BSA Fashion show is my favorite event every year. Students really look forward to seeing their friends on stage. There is always so much anticipation, because they never know what to expect. Beyond the amazing fashion, members of the community are enjoying music, performances, a celebration of culture, the effects and synchronization of the whole event, the participation of diverse students, the message conveyed within each theme... Every year, we try to touch on social justice and feminist aspects during the show, causes that are important to us. And it comes to life through a beautiful, provocative event.